International Business Machines Corp. (NYSE: IBM) earnings were released yesterday (Monday) and there was nothing particularly impressive about them. IBM posted first quarter sales of $19.59 billion – falling short of Wall Street's expectations of between $19.638 billion and $19.698 billion. Revenue was down 11.9% year over year and it marked the 12th consecutive quarter of declining sales. 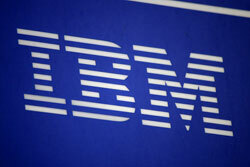 IBM earnings did, however, best earnings-per-share (EPS) estimates of $2.81 by $0.10. IBM earnings came after the bell, but even so, the IBM stock price saw a sudden jolt of euphoria in the lead-up to the IBM earnings release. Shares closed the day at $166.16 – up 3.4%. IBM stock hasn't traded at these levels since CEO Virginia "Ginni" Rometty's infamous October 2014 repudiation of the $20 EPS pledge for 2015. So, why is IBM stock rising on a day of unimpressive IBM earnings? It was all the work of unnecessarily bullish analysts who missed the mark on IBM's current situation. Yesterday, a pre-IBM earnings article in Barron's by Vito J. Racanelli made a surprisingly bullish case for IBM stock. But it overlooked IBM's real challenges and identified the wrong areas of true value for the company. Here's a point-by-point look at what the Barron's article highlighted, and a closer look at why IBM can't support its recent stock rally. "IBM is pruning businesses to get rid of poor performers. Last year, it sold three units that produced $7 billion in sales but lost about $500 million." Barron's is alluding to IBM's customer care, semiconductor, and low-end server businesses when it talks about "poor performers." The problem with painting these three formerly IBM-owned businesses all with the same broad brush of "poor performers" is that not all three were valueless to the company. Prior to IBM earnings, Big Blue shipped its newest mainframe, the z13, to business clients. IBM mainframe clients are typically the Fortune 100 companies who need to handle mission critical data that can best be handled by the raw computing power of these machines. The problem is that in shedding low-end servers, in its 2014 sale to Lenovo Group Ltd. (OTCMKTS: LNVGY), and refocusing its hardware primarily on mainframes, IBM isn't targeting growth in the segment. It's forfeiting any revenue it could make with the next wave of new companies looking to build data centers in a more cost-effective manner. IBM has anywhere from 4,000 to 4,5000 mainframe customers, and IBM mainframe sales will only be a net positive for the company over the next three to five years, Gartner mainframe analyst Mike Chuba told Money Morning. After that, it will start bleeding customers a little at a time. That's because "there's leakage of the smaller customers where a mainframe may not be as cost-competitive," Chuba said. And where are those smaller customers going to go? The very low-end servers IBM got rid of in the Lenovo sale. IBM may maintain high margins, but its hardware revenue growth is only going to stagnate as it fails to replace customers foregoing purchases of the mainframe. So was it the right move? Perhaps, but it wasn't a black-and-white case of IBM getting rid of an unprofitable segment and priming itself for future growth. "One bullish IBM convert, Lloyd Khaner, who runs Khaner Capital Management, says that while IBM has been slow to the cloud party, it's not too late. By virtue of its size and efforts, 'IBM will eventually be a major player in the cloud.' Many investors might not realize that IBM spent $2.2 billion in cloud investments last year and plans to pump $4 billion more this year."